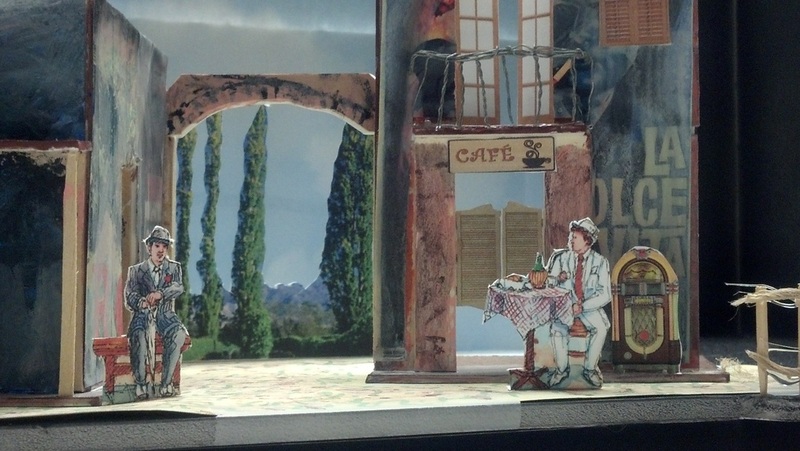 An Italian menu - minestrone, macaroni, ravioli -sung to a snappy tune is the opening number in Scapino, a liberal adaptation of Moliere's Les Fourberies de Scapin, written by Jim Dale and Frank Dunlop. The play takes place in contemporary Naples, Italy, where the leading character, Scapino, devises a complex plot to help two pairs of lovers against parental opposition. Scapino is a rapscallion, a fast-talking, quick-thinking scamp who cleverly manipulates and cajoles everyone into doing what Scapino intends them to do. 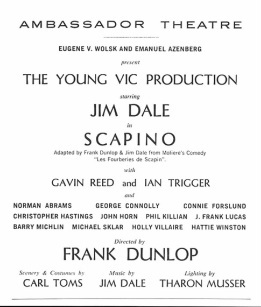 The first Broadway production was presented at the Ambassador Theatre in 1974 and performed by England's Young Vic company starring Jim Dale, who also wrote the show's songs. The Young Vic, under its director, Frank Dunlop, was founded in 1969 and began as a part of The National Theatre of Great Britain. The Young Vic's primary aim is to provide the best in theatre for young people (15 to 25 years of age). Descended from the early comedy of ancient Greece and Rome, the vagabond performers of the commedia dell'arte blanketed Western Europe from the middle Renaissance all the way through the 18th century. Based on a catalog of stock characters, its basic form was mounted on a framework of everyday scenarios, romantic trysts, and tricky situations concerning the exchange of money or property. Not altogether different than today's situation or sketch comedy, the commedia was also highly improvised within the planned structure and theme of each individual performance. The actors continually employed standard bits of humor and "shtick" called lazzi, perfected over decades of practice. These funny bits became highly familiar to audiences and could be inserted into a scene impromptu by a cast member. The other actors would immediately tune into such changes in the direction of the scene, playing it forward. 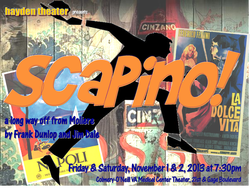 Scapino, or Scapin, is a zanni character from the commedia dell'arte. His name is related to the English word "escape" in reference to his tendency to flee from fights, even those he himself begins. Scapino tends to make a confusion of anything he undertakes and metaphorically "flees" from one thought, activity or love interest to another, as his name implies, although he usually will return to it -- eventually. Self-preservation and self-interest are his main concerns. He is a schemer and scoundrel, and takes a certain pride in these facts. Les Fourberies de Scapin (literally, "Scapin's Deceits") is a three-act comedy by French playwright Molière. The title character Scapin is similar to the archetypical Scapino character. The play was first staged on 24 May 1671 in the theatre of the Palais-Royal in Paris. at a time when theatre companies in Paris were terrified by the enormous success of visiting Italian companies who played in the commedia dell'arte tradition.